Besides issues of international, regional and bilateral importance, India’s External Affairs Minister Sushma Swaraj also discussed business and culture in a meeting with her French counterpart in Paris last evening. The dynamism infused in the Indo-French relations during the visit of French President Emmanuel Macron to India in March seems to be building up as France has committed to increasing bilateral trade in goods with India from EUR 9.85 billion to EUR 15 billion within the next two years. 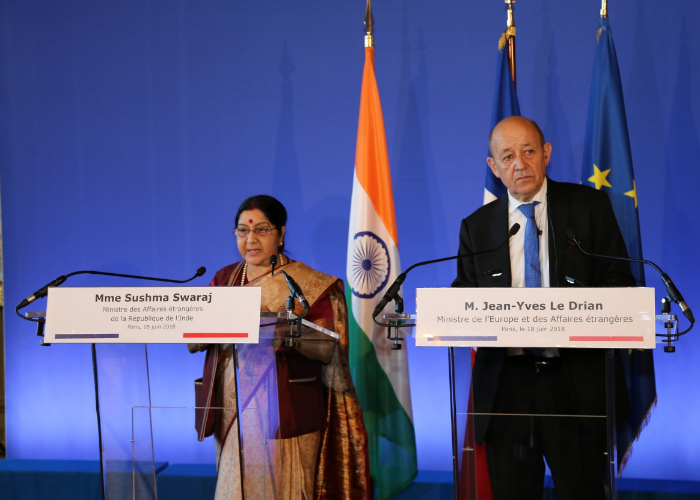 Boosting French trade with India was one of the several issues that Indian External Affairs Minister Sushma Swaraj discussed with her French counterpart Jean Yves Le Drian last evening, during her maiden visit to France. The French have been keen to significantly enhance their presence in Indian business ecosystem, especially in areas where they have in-house strength, notably sustainable development, transport as well as smart cities. The two ministers also discussed numerous international issues such as the impact of the decision by the United States of America President Donald Trump to withdraw from Paris Climate Change Treaty as well as the Iran nuclear deal. Regional issues such as terrorism and situation in South Asia and the Indian Ocean region were also discussed. 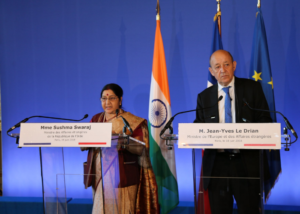 Swaraj thanked Le Drian on behalf of the Indian government for the unstinted support that France has given to India’s bid to join the United Nations Security Council as a permanent member as well as the Nuclear Suppliers Group. The two leaders also exchanged a letter of intent for collaboration in conservation of prehistoric monuments. The first such collaboration will take place in the famous Bhimbetka caves in Swaraj’s native Madhya Pradesh.